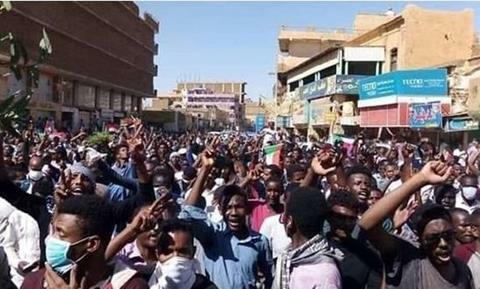 Widespread protests in Sudan against the government of President Omar Al-Bashir have entered their fourth week. 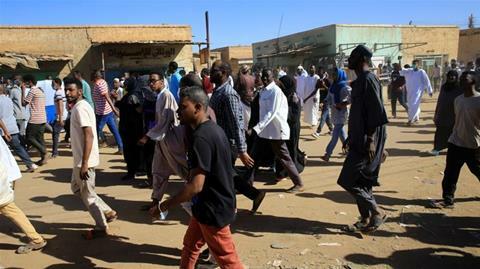 The demonstrations erupted on 19 December in the northern town of Atbara after the removal of bread subsidies, but have since spread across the country and involve a broad cross-section of Sudanese society. 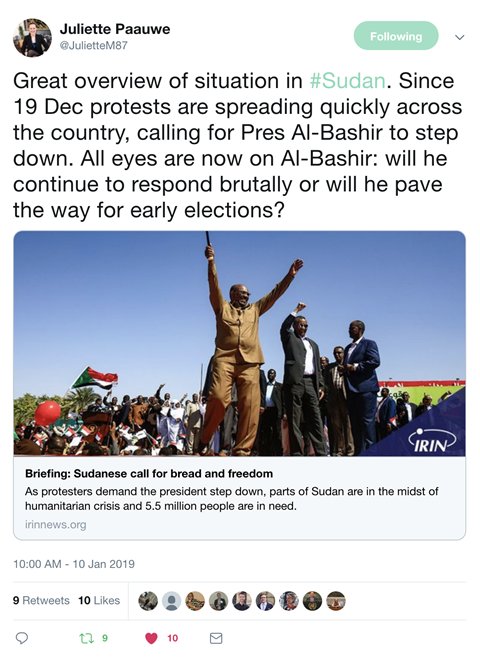 Protesters are demanding the resignation of President Bashir, who has ruled Sudan since seizing power in a military coup in 1989. While attempting to suppress the largely peaceful protesters, the security forces have used teargas and live ammunition, reportedly killing over 40 people and arresting more than a thousand. On 9 January members of the security forces also stormed a hospital in the city of Omdurman searching for people injured during protests earlier that day. In the hospital’s courtyard security officers opened fire and used teargas against patients and hospital personnel. Endemic corruption, mismanagement and high levels of military expenditure have all contributed to rising prices and a severe economic crisis that has plagued Sudan since early 2018. Similar widespread demonstrations took place during 2013 when the government tried to remove fuel subsidies, leading to the security forces killing almost 200 anti-government protesters. Under the leadership of President Bashir, Sudan’s security forces also have a long history of perpetrating war crimes and crimes against humanity in Darfur, South Kordofan and Blue Nile provinces, as well as in what is now the independent state of South Sudan. Sudan is at a political crossroads. The government must end the use of disproportionate and deadly force against peaceful protesters and must respect the right of all Sudanese to freedom of assembly, association and expression, in accordance with international law. All those who have been detained for peacefully demonstrating – including students, journalists and human rights defenders – should be released immediately. Countries with strong bilateral ties to Sudan should emphasize that the use of deadly force against unarmed demonstrators could affect future trade and aid programs and end possible sanctions relief. The government must avoid any further escalation of violence and uphold its responsibility to protect. 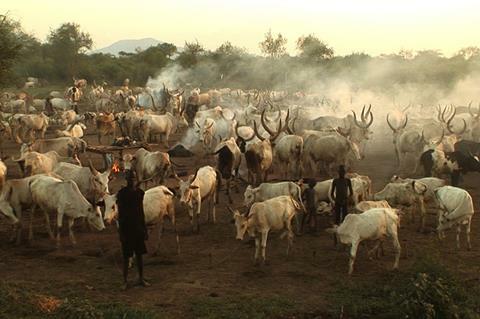 At least 42 people were killed and 86 injured in South Sudan’s Bieh State between 6-9 January due to cattle raiding and inter-communal violence. 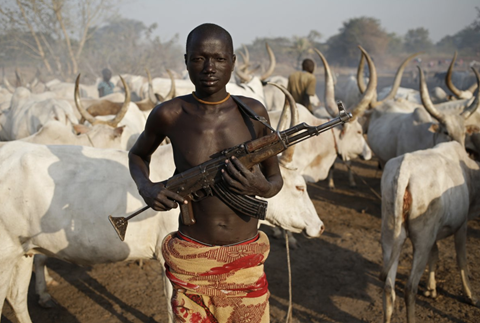 The attacks were carried out by armed members of the Murle community against cattle herders and took place in the wake of a sharp increase in violence reported by the UN Children’s Fund in November. The governor of Bieh State confirmed that the majority of victims were women and children and that at least 2,000 cattle were stolen during the raids. 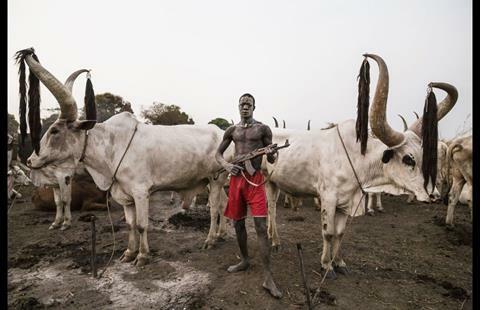 South Sudan has suffered decades of inter-communal violence caused by cattle raiding and retaliatory attacks, often including child abduction. Livestock herding is the main source of income in many parts of South Sudan, and a shortage of grazing land has led to increased tensions between some communities. In recent years such attacks have intensified in scale and have become increasingly deadly, partly due to the proliferation of small arms within the country. During November 2018 the South Sudan Civil Society Forum – a coalition of more than 200 civic organizations – argued that addressing inter-communal violence will be a key challenge for the new transitional government established under the peace agreement that ended South Sudan’s debilitating 2013-2018 civil war. On 31 December the Rup and Pakam communities in Western Lakes State signed a historic agreement, brokered with the support of the UN Mission in South Sudan and Oxfam, pledging to end decades of violence caused by a deadly cycle of cattle raids and reprisal attacks. 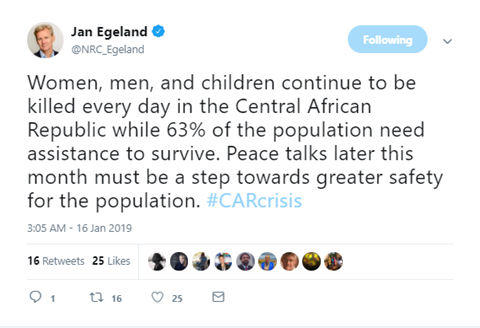 Communities in Bieh State and Jonglei State should follow this example and negotiate similar agreements to help bring an end to recurring violence. The government and community leaders should also facilitate the establishment of local reconciliation committees. 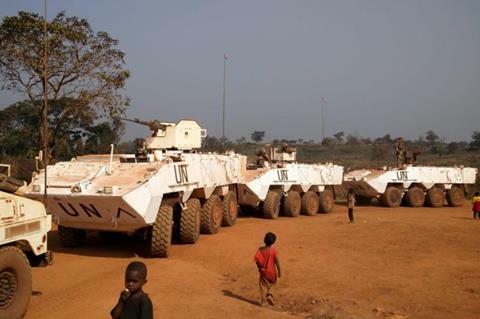 On 31 December an estimated 12,000 civilians were forcibly displaced when suspected members of the Front Populaire pour la Renaissance de la Centrafrique armed group attempted to take over the south-eastern town of Bakouma in Central African Republic (CAR). 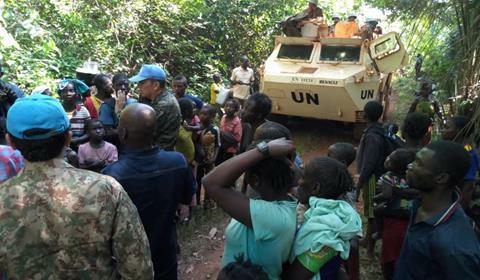 The UN peacekeeping mission (MINUSCA) reported that more than 90 percent of the town’s houses have been looted, and people were forced to seek refuge in nearby forests. 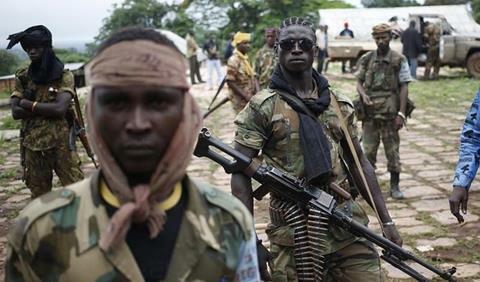 On 10 January fighters believed to belong to the Union pour la Paix en Centrafrique armed group also attacked the town of Bambari in central CAR. While MINUSCA troops were rapidly deployed to provide protection for civilians, the situations in both Bambari and Bakouma remain volatile. 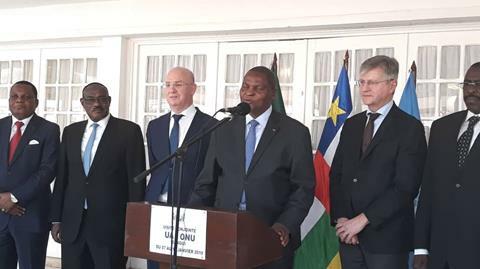 The recent attacks overshadowed last week’s announcement that the government will reopen dialogue with various armed groups under an African Union-led peace initiative. 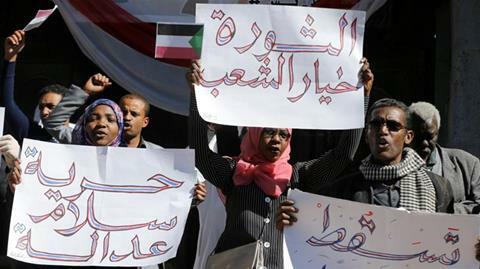 Recent fighting may jeopardize the peace talks that have been scheduled to take place in Khartoum, Sudan, on 24 January. An estimated 70 percent of the country’s territory remains under the control of rival armed groups that have committed mass atrocity crimes, including targeted attacks against civilians, sexual violence and child recruitment. MINUSCA remains the primary force capable of preventing and responding to attacks perpetrated by predatory armed groups, but the Mission is still struggling with critical capacity gaps that undermine its ability to consistently protect civilians. During November Alfred Yekatom, a former commander of an anti-balaka militia and a Member of Parliament, was transferred to the International Criminal Court (ICC) and will face charges of war crimes and crimes against humanity. During December French authorities arrested Patrice-Edouard Ngaïssona, another anti-balaka leader, and also authorized his transfer to the ICC. The arrest and potential prosecution of leaders of armed groups at the ICC or via CAR’s Special Criminal Court constitutes an important step towards ending impunity for atrocities committed in the country. Accountability for perpetrators and justice for victims remains an essential part of establishing lasting peace in CAR. 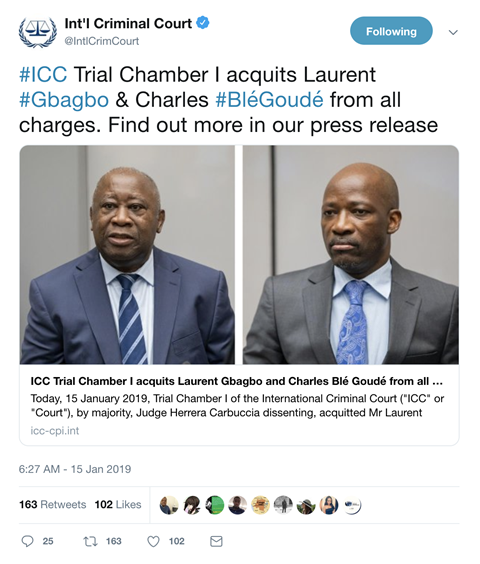 On 15 January the International Criminal Court (ICC) acquitted Côte d’Ivoire’s former President, Laurent Gbagbo, and the former Minister for Youth Affairs, Charles Blé Goudé, of crimes against humanity. The judges concluded that the Prosecution was unable to provide sufficient evidence demonstrating their responsibility for a government plan of violence against civilians during the post-electoral crisis that gripped Côte d’Ivoire between December 2010 and April 2011. Elections were held in Côte d’Ivoire in November 2010 and were won by opposition candidate Alassane Ouattara. President Gbagbo refused to cede power and state security forces and militias loyal to Gbagbo attacked civilians perceived to be Ouattara-supporters. At least 3,000 people were killed in the resulting violence. On 6 August 2018 President Ouattara's government announced amnesties for 800 people accused or convicted of crimes committed during the post-election crisis, including Simone Gbagbo. 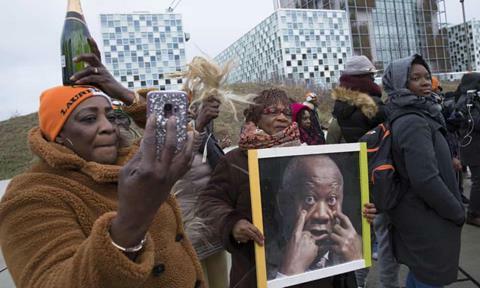 The government of Côte d’Ivoire has refused to transfer the former First Lady to the ICC, despite the court charging her with crimes against humanity. In order to achieve a sustainable peace the government of Côte d’Ivoire should ensure that all perpetrators of past atrocities are held accountable for their crimes, regardless of political affiliation. The government should also fully implement the recommendations of Côte d’Ivoire’s Truth and Reconciliation Dialogue Committee.